In this post, we are going to talk about myself as an artist. I hope you enjoy the adventure you are about to embark upon. Feel free to comment! Much of my time as an artist is spent asking myself if my art would gain the approval of an artist that I admire…and most of the time that artist is George Herriman. His art style and character writing shot me in the heart like Captain Ahab’s harpoon. Even though there are tons of fish in the sea of my heart, I will always say that George Herriman is the Fairy Godfather to my art life. What he did with comics is what I aspire to bring back to life so that the generations that I encounter as readers will know the beauty of past genius. This is how Boy's Cat Started off. This is what it is today! It’s something I’m proud of. It’s also a fine example of what an artist can accomplish with friends who aren’t afraid to give feedback. And while I’d like to give a list of credits at this point in time, I’m aware that this little tug boat has still got a long way to go before it can reach syndication, though I believe in it full-heartedly. But a girl can’t live off of syndicate funding alone. I’m trying to branch out with illustrating, as well. I’ve got a gig going on now that I still have a lot of work to do for, but it’s going to be a good ride (whether there are potholes in the road or not). This is because I have a great author, who, though she may also be new to this, did her research and is really working hard to get her book published. I’ve read countless articles and even have a few books on getting stuff published, and I know it’s rare to find someone who is as sincere as my author. I can’t show you guys anything now, but expect posts for advertisement around March for when this thing hits the shelves. Other things will come along. I’m hopeful…and prayerful. I want to be known as the Queen of Cartoons! …I realize that’s rather vague, but hear me out, will you. I’ve been studying cartoons (both animated and stationary) since I was a little girl. I know, I know, everyone watched toons as chitlens, but usually people have an age when they drop it all. I’m from a small town, where headlines consisted of things like who was voted the latest Old Crab. While I may have had trouble keeping in the mainstream loop, this gave me a chance to develop my interests into skills. While I watched these cartoons I took notice of what worked and what didn’t (there was a lot of that…I’ve sorta became a snob), I would draw them to develop a style vocabulary, but, most of all, I would dream. Dream of what kind of people worked on these cartoons and what it would be like to work with them. 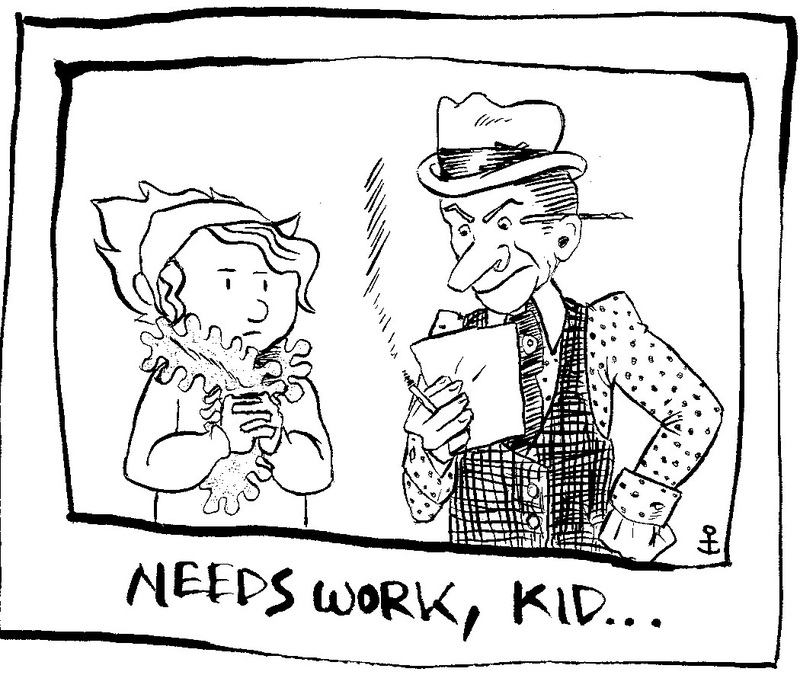 Soon I became exposed to newspaper comics, enjoying dailies with my step-dad (aka Papa). After that, upon arriving at college, I was exposed to comic books for the first time. These three fields, animation, newspaper comics, and comic books, filled me with a creative spirit that is alive me to this very day. I am happy with these medias. I still am willing to try new things, but these media are special in that they are my tools to telling stories. However, the American bred girl that I am, I soon became hungry for new story material. I was becoming more and more displeased with the latest shows and comics (well…not all of them). So, I turned to the past. It started with a trip to the ASU Library, a search that started for some of my childhood favorites. This trip, however, turned into a chance encounter with a couple of Buster Keaton DVDs. I had never been exposed to silent films before, except for the more famous Charlie Chaplin clips on YouTube, so you can imagine my splendor (if you can’t then you should really look into Buster Keaton). I became obsessed. There were many DVDs at the library, but that most certainly wasn’t enough. Not only because I knew that Keaton had done many more films than they were providing, but because some of his earlier films introduced me to many other slap stick artists; Fatty Arbuckle, Al St. John…I met Chaplin too, but only through his own films. Lucky many films were on public domain and view-able through Video.Google.com. * The point being, I became heavily influenced…and was moved by how little these artists were still known. Their work was good, REALLY good, and I knew that if people could just get over the out of date imagery, they would see it too. While I’m still in love with the charm of old film quality, I have since then come to understand that change is inevitable and it is impossible to believe that all of society would conform to my way of thinking. Moving on, I decided to take this passion and let it influence my aesthetic choices. These are the jewels that will adorn the crown of my title as Queen of Cartoons; my reign, a living echo of their success. Ok, so I have motivation, but what shall I use it for. Well, have started my campaign by honing my skills as a dailies’ artist, George Herriman’s guidance in my heart…I still have a ways to go, but it’s something. The end of the tunnel may be something entirely different. While it is not something I want to do as a profession, I hope to one day have a gallery show , showcasing the work of olde as well as creating work that uses the tools and tips of a time without the shortcuts that technology began to create. These will mostly be animations and comics but with the influence of slap stick. While I recognize that my interests may change over time, I most certainly would still love to one day have a show. This goal is mostly due to the fact that I realize the reality that the work I want to do may only have a place in a gallery. Part of my dream may also involve an entry into independent film with some hand animated goodies…if that is successful, then maybe even a studio, as long as I’m working with others who are of the same “royal” dreams. This is getting rather long. my word count is over 1000. I’m going to continue this post in another post. Please read it.